Travel for a moment, in your mind, to the outer reaches of rural America; a cypress swamp in Northern Florida, a dark and foggy Ozark hollow, or a steep and rugged Virginia mountainside. Here local crafters make use of materials at hand, and simple designs emerge as the most creative, functional and beautiful products. The scratch box turkey call is one such product. Wood and a little glue is all it takes, plus a handed -down design or hours of experimentation to develop a new pattern. Wood and glue—not even a spring and screw needed to connect the friction. 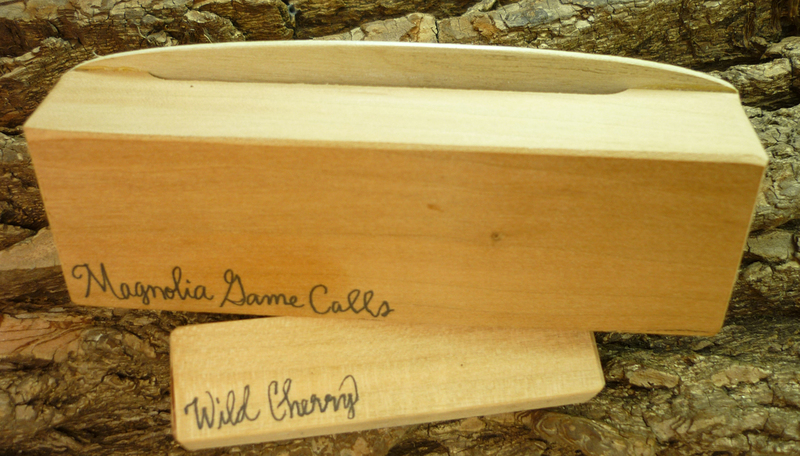 Scratch box, striker call, scraper call; each of these names refers to the small, two piece wooden turkey calls with design variations on a constant theme- hollow wood chamber with striker lip and a solid, wood striker piece. Box shapes vary from the long, narrow, rectangular coffin style to a flatter, nearly square, cigarette carton shaped box. As in standard boxes, woods used deliver different pitches. Cedar, the most commonly used wood, and cherry give a higher pitched (sweet) young hen tone. Walnut yields a deeper, courser tone like a gobbler or raspy hen, and poplar delivers its characteristic, low 'yawping' yelp. 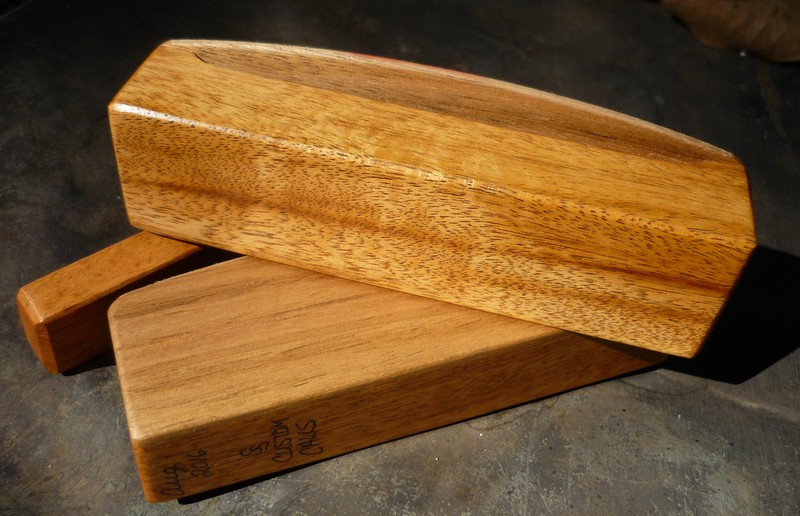 Clucks on a scratch box, are some of the most genuine, rivaling the cluck on a slate call. These striker call clucks have that sharp, hollow, 'popping' resonance that is hard to distinguish from the real thing. Sometimes a good cluck is all it takes to seal the deal. The two most common methods of using a scratch box are as follows. These descriptions are based on right hand usage. For left hand use reverse the process. 1. Hold the box with right hand, striker lip down and on outside of box away from caller. Thumb is on the inside of box at lower end, with back of thumb facing caller. Index finger extends straight outward along the bottom of the box or bent and wrapped around same side as forefinger. Forefinger is bent at knuckle and positioned on the outside of box. Thumb is on front of box and bent forefinger is directly beneath thumb on outside of box. For best results, grip the box gently Striker is held in left hand between tip of thumb and tip of forefinger out from palm. Rounded edge of striker faces away from left palm. While holding striker stationary, place the middle of the striker lip of box perpendicular to striker, slightly outward from center. Chalk the striker surface occasionally. To make the yelp, draw the striker lip of box along striker surface. As you draw, twist the box lip upward with wrist action. This motion will deliver the breaking double note of the yelp. Best results occur by executing this motion gently with the slightest downward pressure. Striker lips are tuned thin for good sound. This makes them delicate and subject to cracking or breaking if too much pressure is applied. To insure the preservation of your scratch box, apply a slow and easy hand. The cluck is made by holding the box perpendicular to the middle of the striker, applying firm but not hard downward pressure, then quickly moving the box about 1/8 inch. The louder, cutts can be made by applying a little more downward pressure. To purr, drag the striker lip slowly across the striker. 2. To use the second method for using the scratch box, hold the call stationary in the left hand. Front of box faces the caller and is held between tips of thumb (at lower end) and tip of index or forefinger at top end. Striking lip is at bottom of call with sound chamber opening visible to caller. Grasp the striker between thumb and forefinger of right hand. Place rounded edge of striker perpendicular to and on top of striking lip at center. To yelp, push the striker away and across lip, turning the wrist slightly downward on each stroke. For the cluck, make striker and lip contact, then with a quick, short snap; pop striker off of lip. To purr drag striker across lip. Each scratch box type has a unique personality and sound. For a full range of turkey tones try several boxes of different designs and made from different woods. For best performance, chalk the striker occasionally, keep moisture away from the call and unless you want a busted lip, don't bear down too hard on the scratch box blade. The preceding text is the sole thoughts and opinion of George Lozzi, Turkey call enthusiast and owner of MIDWEST Turkey Call Supply. For reprint or copy permission, please contact George at [email protected] or call 800-541-1638.